Land preparation for the stadium began in mid-2007, with the official construction start date on 22 May 2008. The stadium held its first public event in March 2012, serving as the finish line for a celebrity run organised by the National Lottery. Holding 80,000 for the Olympics and the Paralympics, the stadium re-opened in July 2016 with 66,000 seats, but with capacity for football limited to 60,000 under the terms of the lease. The decision to make West Ham United the main tenants was controversial, with the initial tenancy process having to be rerun. The stadium hosted several 2015 Rugby World Cup matches, two England rugby league Test matches, and the 2017 IAAF World Championships in Athletics and 2017 World Para Athletics Championships (the first time both events had been held in the same location in the same year). The stadium can also hold concerts with up to 80,000 spectators, and, due to its oval shape and relocatable seating, was deemed to potentially be suitable for other sporting events such as baseball and cricket. During London's bid for the games, promotional materials featured a main stadium with a roof "designed to wrap itself around the venue like muscles supporting the body", however at that time there had been no formal design brief agreed. While the bidding process was ongoing West Ham had talks with the ODA about contributing to the development of a multi-purpose stadium, should London win the bid. The government preferred to produce a brief for an athletics only stadium which would be largely disassembled after the games with the lower tier remaining in place as a permanent athletics facility to replace the Crystal Palace National Sports Centre. With the original Olympic design finalised and being built, the government had a change of heart and a bidding process for a multi-sport post-Olympic legacy was launched. 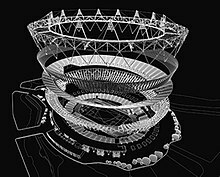 On 13 October 2006, London Organising Committee of the Olympic and Paralympic Games confirmed that it had selected Sir Robert McAlpine and Populous to start exclusive negotiations with, to fulfil the eventual design and build contract of the new Olympic Stadium after no other organisations met the bidding criteria. The stadium design was launched on 7 November 2007. The stadium's track and field arena is excavated out of the soft clay found on the site, around which is permanent seating for 25,000, built using concrete "rakers". The natural slope of the land is incorporated into the design, with warm-up and changing areas dug into a semi-basement position at the lower end. Spectators enter the stadium via a podium level, which is level with the top of the permanent seating bowl. A demountable lightweight steel and pre-cast concrete upper tier was built up from this "bowl" to accommodate a further 55,000 spectators. To allow for fast on-site assembly, compression truss and roof column connections were bolted; this enabled easy disassembling of the roof structure after the closing ceremonies. The cable-supported roof structure covers approximately two-thirds of the stadium's seating. Reaching 70 metres (230 ft) above the field of play, the stadium roof held 14 lighting towers, or paddles, that collectively contained a total of 532 individual 2 kW floodlight lamps. The lights were first officially switched on in December 2010 by Prime Minister David Cameron and London Mayor Boris Johnson. During the games, the towers were fitted with additional ceremony lighting, and 4 of the 14 towers held large temporary video screens. The stadium's 80,000 seats had a black and white 'fragment' theme that matched the overall branding design used by LOCOG for London 2012. The lines all centred on the finish line in the stadium. The seats were made in Luton and were fitted between May and December 2010. During the Games, the Stadium's grandstands contained a lighting system developed by Tait Technologies that allowed them to function as a giant video screen. Individual "paddles" containing nine LED pixels each were installed between each seat of the stadium, which were controlled via a central system to display video content wrapped around the stadium. The system was primarily intended for use during the ceremonies of the Olympics and Paralympics – over 70 minutes of animated content were used during the Olympics' opening ceremony. 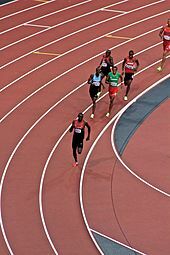 The red Mondo 400-metre athletics track used for the London 2012 games was laid in August 2011, possessed nine lanes, and was 13.5 mm (0.5 in) thick. It used two vulcanised rubber layers, one of which was a cushioning underside with elongated diamond-shaped cells, which allowed them to flex in any direction. During the four London 2012 ceremonies, the track was protected via synthetic covering. For the stadium's transformation, the track was protected from construction work for the 2015 events by covering it with a plastic sheet layer and burying it under 75 cm (30 in) of soil. The Mondotrack surface was removed in early 2016 and a new surface, using 17,000 sqm of the improved Mondotrack/WS, was laid that May. Some of the original running track from (mainly) the home straight was kept so that it could be sold and auctioned to the public, thereby raising money to reinvest into operating the stadium and its neighbouring community track. The grass playing field was lengthened by several metres at either end for the 2015 rugby matches to fit a suitably-sized rugby/football pitch, and was reseeded with a Desso GrassMaster artificial-natural hybrid pitch approved for Premier league matches of 105 by 68 metres (115 by 74 yd), ready for West Ham United, complete with undersoil heating. In football/pitch mode, the pitch is surrounded by artificial turf and carpeting that covers the exposed sections of the running track. The stadium design received a mixed response from the media, with reviews ranging from "magnificent" to a "bowl of blancmange". The design was promoted as example of "sustainable development", but some architecture critics have questioned both its aesthetic value and suitability as a national icon – especially when compared with Beijing National Stadium. For example, Ellis Woodman, Building Design's architecture critic, said of the design: "The principle of it being dismountable is most welcome... it demonstrates an obvious interest in establishing an economy of means and as such is the antithesis of the 2008 Olympic stadium in Beijing. But while that's an achievement, it's not an architectural achievement. In design terms what we're looking at is pretty underwhelming." He went on to criticise the procurement and design processes – stating of the latter that it should have been subject to an architectural competition. This view was echoed by Tom Dyckhoff, The Times's architecture critic, who described the design as "tragically underwhelming" and commented that the "architecture of the 2008 and 2012 Olympics will, in years to come, be seen by historians as a "cunning indicator of the decline of the West and the rise of the East". Despite the criticism the Olympic Stadium was nominated for the 2012 Stirling Prize in architecture losing out to the Sainsbury Laboratory at the University of Cambridge. the costs involved in dismantling the stadium – and surrounding "pods" – has not been factored into the estimated cost. The cost of £537 million compared with the 1908 Olympic Stadium cost of £60,000 (£5.6 million in 2010). The stadium site is on former industrial land between the River Lea (which rejoins the Navigation below Old Ford Lock), the City Mill River, and the Old Pudding Mill River; parts of the Bow Back Rivers. Another branch of this system, St Thomas' Creek, 200 metres (660 feet) to the south, completes an "island" surrounded by water. 200 metres (660 feet) to the east is the Waterworks River; with the London Aquatics Centre on its eastern bank. This "island" site for the stadium lies at the southern end of the Olympic Park. To make room for the stadium, the already partially obstructed Pudding Mill River, a short channel of the Lea which ran from the west side of the stadium south-eastwards across the stadium site, was filled in. Dennis Hone, chief executive of the LLDC, revealed in November 2012 that the stadium would not meet its reopening deadline of 2014. Instead the stadium would reopen in August 2015 with the stadium retaining a capacity of around 50,000 for athletics. Following the granting, in March 2013, of a 99-year tenancy to West Ham United, the E20 LLP, a joint organisation by the London Legacy Development Corporation and Newham Council were specifically set-up to oversee redevelopment of the stadium into a UEFA Category 4 venue seating 66,000 spectators. The reconfiguration saw work on a new roof, corporate areas, toilets, concessions and retractable seating. West Ham contributed £15 million and Newham Council £40 million for the work to be carried out with the LLDC and the British Government making up the rest. Approval was granted for the installation of retractable seating on all sides of the stadium and an 84-metre (92 yd) transparent roof. Olympic Stadium during its renovation minus a roof and floodlights and a crane visible. Balfour Beatty were initially contracted to construct the new roof for £41 million; in January 2014 they were awarded a £154 million tender, which includes the earlier contract for the roof, to complete the stadium's transformation works. Imtech G&H were awarded a £25 million contract to carry out electrical and plumbing work. Paul Kelso, working for Sky News, discovered in September 2014 that the cost of the conversion of the stadium may rise by £15 million, due to additional work to strengthen the structure, to allow it to support the new roof. It was revealed neither West Ham United nor the taxpayer would have to meet the additional cost as Balfour Beatty would contribute with the remainder funded from the existing LLDC transformation budget of the Olympic Park. In October 2014, the LLDC contributed a further £35.9 million towards the project with the funding coming from reserves and income generated by other means. Work commenced on 13 August 2013 with the removal of 25,000 seats and the grass from the field of play. The athletics track was covered with a 75 cm (30 in) layer of recycled concrete to protect it during the heavy lifting. In November 2013 work commenced to remove the fourteen floodlight panels as part of the £200 million conversion of the stadium. In March 2015 work began on installing the new floodlights. Each floodlight panel is 18 metres (59 ft) tall and weighs 45 tonnes (50 short tons), and will sit 30 metres (98 ft) above the stadium's floor, suspended from the roof rather than sitting on top; in total there are 14 panels. As the floodlight work began, work on a steel halo structure that encircles the stadium, containing 96 turnstiles, catering and toilet facilities, concluded. The black and white seating design from the Olympics, was replaced with a white, blue and claret design. The new design includes West Ham's name on the East Kop Stand and symbolic crossed hammers on all lower tier stands, and the retention of the 2012 shard design on the upper tier, albeit in new colouring to match the Stadium's anchor tenant. Work continued through 2016 to transform the stadium into a home for West Ham, with the club's colours and giant model West Ham shirts added to the stadium concourse. A West Ham store and coffee shop was opened on 23 June. Wikimedia Commons has media related to Community track at Queen Elizabeth II Olympic Park. Following the demolition of the 2012 warm up track and to comply with IAAF rules requiring a warm up track at Construction Category 1 facilities, a new 6 lane community track (8 lanes on the straights) has been created immediately adjacent to the south of the Olympic Stadium. The track will be home to Newham and Essex Beagles Athletic Club from 2017 and will be open for around 250 days of the year. The construction of the track was funded by a grant from the London Marathon Trust. David Rudisha of Kenya setting a World Record for the 800 metres in the Olympic final. The Olympic Stadium hosted its first public event on 31 March 2012, serving as the finish line for the National Lottery Olympic Park Run. Five thousand participants (including celebrities, British athletes and members of the public who won a draw organised by the National Lottery) took part in a five-mile run around Olympic Park, entering Olympic Stadium to the theme from Chariots of Fire to run the final 300 metres on its track. The stadium hosted two warm-up events for the London 2012 Olympic and Paralympic Games as part of the London Prepares series. The venue hosted the British Universities Athletics Championships and the London Disability Grand Prix in May 2012. On 6 May around 40,000 people attended an event entitled "2,012 hours to go: an evening of athletics and entertainment". The evening was hosted by Gabby Logan and Vernon Kay, and Jon Culshaw, Mel C, Hugh Bonneville, Chipmunk and Jack Whitehall appeared. Niamh Clarke-Willis, a nine-year-old, was chosen to open the stadium ceremonially. 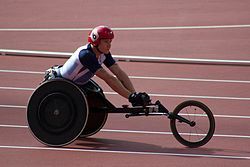 During the London Disability Grand Prix, Paul Blake (T36, 1500 metres), Hannah Cockroft (T34, 100 metres), Michael McKillop (T37, 1500 metres) and Richard Whitehead (T42, 200 metres) all set new world records. The stadium also hosted the athletics events of the British school games. The stadium hosted both the opening and closing ceremonies at the 2012 Olympic Games. During the Athletics events of the Olympic Games David Rudisha broke his own world record for the 800 metres to become the first man to run the distance in under 1 minute 41 seconds. In the 4 × 100 metres relay the team from Jamaica also broke their own world record from the 2011 World Championships by two-tenths of a second. The United States women's 4 by 100 metres team beat the previous best set by East Germany in 1985, recording a time of 40.82 seconds to set a new world record. Olympic records were set by Usain Bolt, who ran the second fastest 100 metres, Renaud Lavillenie in the Pole vault by 1 cm, Sally Pearson recorded a record time in the 100 metres hurdles and Tatyana Lysenko set a new mark in the Hammer. The stadium also hosted both the opening and closing ceremonies of the 2012 Paralympic Games. Over the course of the Paralympic Games athletics events, world records were set on the track by; Oxana Boturchuk Martina Caironi, Chen Junfei, El Amin Chentouf, China, Libby Clegg, Arnu Fourie, Marie-Amelie le Fur, Terezinha Guilhermina, Mahmoud Khaldi, Samwel Mushai Kimani, Walid Ktila. Liang Yongbin, Rosemary Little, Liu Ping, Liu Wenjun, Gunther Matzinger, Michael McKillop, Mateusz Michalski, Yohansson Nascimento, Oscar Pistorius, David Prince, Evgenii Shvetcov South Africa, Leo Pekka Tahti, Abraham Tarbei, Iurii Tsaruk, Richard Whitehead, Abderrahim Zhiou, Zhu Daqing and Zhou Guohua. Multiple World Records on the track were set by Yunidis Castillo, Assia El Hannouni, Evan O'Hanlon, Jason Smyth, Fanie van der Merwe and Marlou van Rhijn. In the field events, World records were set by Hani Alnakhli, Alexey Ashapatov, Aigars Apinis Lahouari Bahlaz, Mohamed Berrahal, Kelly Cartwright, Yanlong Fu, Leonardo Diaz, Zeljko Dimitrijevic, Tanja Dragic, Najat El Garraa, Javad Hardani, Todd Hodgetts, Jun Wang, Maroua Ibrahmi, Juan Yao, Mohsen Kaedi, Mohammad Khalvandi, Gocha Khugaev, Karolina Kucharczyk, Assunta Legnante, Maciej Lepiato, Liu Fuliang, Drazenko Mitrovic, Azeddine Nouiri, Katarzyna Piekart, Mariia Pomazan, Nikita Prokhorov, Qing Wu, Markus Rehm, Raoua Tlili, Wang Yanzhang, Zhu Pengkai, Oksana Zubkovska. Multiple records were set in the field by Dong Xia, Birgit Kober, Na Mi, Yang Liwan, and Wang Zhiming. The decision on how to use the stadium after the Olympics went through two rounds of bidding: the first was rejected[by whom?] on 11 October 2011, after concerns had emerged about European Union competition law and particularly the risk of illegal state aid. The Olympic Park Legacy Company (OPLC) set five criteria: that the new tenant should produce a viable long-term solution that provided value for money, secured a partner with the expertise to operate a legacy solution[clarification needed], reopened the stadium as quickly as possible, made the stadium a distinctive physical symbol that supported regeneration, and allowed flexible usage. After receiving and pre-screening over 100 expressions of interest, the formal bidding process of selecting the post-Olympics user of the stadium opened on 18 August 2010. It ran until 30 September, after which the OPLC drew up a shortlist, with a view to selecting a tenant by the end of the financial year (31 March 2011). On 12 November 2010, it was announced that two bids had been shortlisted for the stadium post-Olympics. They were a joint bid from Tottenham Hotspur and Anschutz Entertainment Group (AEG), and a second bid from West Ham United and Newham Council. The legacy plan for the stadium had involved converting it into a 25,000- to 30,000-seat athletics stadium with a sports training, science and medicine centre after the 2012 Paralympics. Media reports, however, suggested that several potential tenants were interested in moving to the stadium after the games. Media speculation and expressions of interest which did not result in bids included: the England and Wales Cricket Board and Kent County Cricket Club; Middlesex County Cricket Club, Essex County Cricket Club: Wasps RFC; Saracens R.F.C. ; London Skolars R.L.F.C. ; Major League Baseball; the National Football League, which had been looking at the potential of a franchise in London; and Leyton Orient F.C.. These joint bidders had each separately expressed interest in the venue, but submitted a joint bid. AEG is the company that redeveloped the loss-making Millennium Dome exhibition venue in South East London into the profitable music venue The O2. On 26 July 2010, it was rumoured that Tottenham might be interested in taking over the stadium after the Games. The club had plans to build a new stadium adjacent to their current stadium as part of the Northumberland Development Project, but the planning application and funding were proving difficult, making the Olympic Stadium a viable option. After the acquisition of West Ham United in 2010 by David Gold and David Sullivan, the new owners expressed their desire to make the stadium the club's new home. With Boris Johnson expressing his desire for a football team to take over the stadium after the 2012 Olympics and Paralympics, this seemed the most likely option. At the opening of the formal bid process, West Ham United were considered favourites once they withdrew their initial opposition to keeping the running track, as well as planning a £100 million conversion to create a 66,000 capacity venue, which would also host international football, international athletics, as well as Essex County Cricket Club, international Twenty20 cricket matches, NFL games, and Live Nation events. On 11 February 2011, the Olympic Park Legacy Company (OPLC) unanimously selected West Ham United and Newham Council as the preferred bidders to take over the stadium after the 2012 Games. But Leyton Orient complained that the stadium was too close to their ground and would breach FA rules. They claimed that West Ham's plans could force them into bankruptcy. On 3 March 2011, West Ham United's proposed move to the stadium was approved by the British Government and London Mayor Boris Johnson. Tottenham Hotspur F.C. and Leyton Orient F.C. applied for a judicial review to overturn the Olympic Park Legacy Company's (OPLC) decision; however, this appeal was rejected in June 2011. Tottenham Hotspur appealed the decision not to have a review on 29 June 2011. The OPLC announced on 5 July 2011 that an independent review into the awarding of the Olympic Park Stadium to West Ham United was to be carried out following the discovery on 30 June 2011 that an employee, Dionne Knight had been engaged by West Ham United to carry out consultancy work relating to the stadium without permission of the OPLC. Knight had already declared to the OPLC that she was in a personal relationship with a director of West Ham United, and was suspended whilst a possible conflict of interest was investigated. On 22 August 2011, the independent investigation ruled that the process was not compromised and thus the bid process will not be reopened. On 23 August, the day before Tottenham Hotspur were due in court, they staged "intense negotiations" with the office of the Mayor of London, and looked set to drop all claims for a review and be offered funding for their own stadium. However, the next day Tottenham did attend court despite being close to striking a deal about their own stadium. Tottenham and Leyton Orient won a review of the decision, being told that they had an arguable case. The review was scheduled to take place on 18 October 2011. Even if Tottenham abandoned the review, due to being granted a new stadium as part of their Northumberland Development Project, Orient were expected to continue, with its owner Barry Hearn calling the decision to grant a review "a great day for the little man". However, the bid was later cancelled before the review was completed, due to a series of concerns regarding EU laws. Once the original deal collapsed a new process to select a tenant was begun. The athletics legacy clause was clarified to ensure that a track remained in the stadium. West Ham immediately announced plans to become tenants of the stadium. On 17 October 2011, a day before they were due in court for the judicial review to start into the original bidding process, Tottenham Hotspur ended their legal challenge about the original decision to award the stadium to West Ham United. This marked Spurs' end to their interest in the stadium. On 18 October, Leyton Orient submitted an application to the Football League for permission for a move to the stadium. Chairman Barry Hearn said, "We are asking for a 25,000-seater stadium and we want to see if we can get around the athletics track. It has to stay, we know that. But can we build up, if not down, and see if it's possible to get it covered while we play?". Intelligent Transport Services, in conjunction with Formula One. University College of Football Business (UCFB), an affiliate of Bucks New University. Essex County Cricket Club with the University of East London. In April 2012, the Olympic Park Legacy Company was dismantled and responsibilities transferred to the newly constituted London Legacy Development Corporation (LLDC). Daniel Moylan, chairman of the LLDC, was removed by Mayor Boris Johnson on 12 September 2012, after having made changes to the leadership of the organisation that annoyed some Board members. Johnson took on the chairmanship of the co-operation himself. In December 2012, West Ham were named as the preferred bidder for the stadium with a separate operator co-ordinating community and sporting use, as well as concerts and events. Leyton Orient's bid was rejected due to its commercial viability and the bid from Intelligent Transport Services, in conjunction with Formula One, was rejected for having too much speculation and uncertainty in their business plan. However, with so much public money going into the stadium and its redevelopment, the BBC learned that David Gold and David Sullivan must share any profits they make if they sell the club. West Ham were given three months to improve the terms of their deal or lose the stadium; with Johnson going with plan B without football. The two parties seemed to find common ground in February 2013, with West Ham, reportedly, agreeing to paying £2.5 million in rent per year. They additionally promised to pay back any extra cost for the roof and seats within ten years. Gold stated at the beginning of March that a deal could be complete by the middle of the month. On 22 March 2013, West Ham United secured a 99-year lease deal, with the stadium planned to be used as their home ground from the 2016–2017 season. In July 2013, UK Athletics received a 50-year deal for the use of the stadium. UK Athletics will have access to the stadium every year from the last Friday in June until the end of July. On 6 March, Barry Hearn of Leyton Orient stated that he would mount another legal challenge as he believed the rules set out by the LLDC had not been followed. Hearn also said he felt Leyton Orient's proposed ground share had been ignored and not properly explored. In April 2013, he was informed that his call for a judicial review had been rejected. An oral application was submitted in June 2013. On 19 September 2013, Leyton Orient lost their bid to win a judicial review into the decision to grant West Ham the tenancy of the Olympic Stadium. At the High Court, Mr Justice Lewis said the LLDC was entitled to make the decision which was not "irrational". In November 2013 it was the House of Lords' opinion that Leyton Orient should be allowed occasional use of the stadium, with Lord Harris telling Orient and West Ham to "stop squabbling like children." Dennis Hone stated that he was in talks with Barry Hearn over occasional usage, but that it would not mean a permanent groundshare. In early December, the LLDC said that there was nothing to stop Orient from negotiating a rental agreement with whichever firm ends up running the stadium. Orient, however, would not be able to negotiate a 99-year deal like West Ham and would only have usage of the stadium when the Hammers are not playing. On 1 July 2014, Leyton Orient brought an end to their dispute with the Premier League regarding the future use of the stadium, after a confidential agreement between the two parties was reached. Supporters of various rival clubs pressed for an inquiry into the LLDC's granting of West Ham's tenancy, arguing that West Ham were being given an unfair advantage by the arrangement. However, in September 2015 the government rejected holding such an inquiry. In October 2015, the LLDC released a 207-page document with redacted sections. West Ham's annual rent was not revealed as this was seen to be commercially sensitive information. On 14 April 2016 it was revealed that West Ham will pay £2.5 million per year during a 99-year lease of the stadium but will not have to fund police, stewarding, heating, pitch maintenance, or corner flags. Barry Hearn described the deal as one his dog could have bettered. In September 2018, Lyn Garner, chief executive of the London Lecacy Development Corporation, revealed that the £2.5m paid per year by West Ham did not even cover the cost of staging matches leading to increased debts in running the stadium for the 97-year remainder of their tenancy agreement. The LLDC had established a commercial subsidiary, E20, as landlords for the Stadium; and E20 - through their appointment of a stadium operator - provide for all matchday stewarding, catering, cleaning, fabric and maintenance services - albeit that they profited through the bulk of franchise fees from catering concessions and bars. E20 and West Ham became embroiled in a protracted legal dispute in the High Court as to which elements of service were included in the annual payments under the 99-year lease, and which elements might be expected to involve an additional regular facility fee (with particular reference to West Ham wishing to replace the covering to the athletics track with one in club colours); and E20 refused to open discussions on allowing the usable capacity of the stadium to increase to its full potential of seats unless these disputes were resolved to their satisfaction. However, in November 2018, both parties agreed to an out-of-court settlement, under which the annual lease payment would be uplifted as the usable capacity increased towards 66,000. In October 2014 The Evening Standard reported that French company Vinci SA were favourites to be given a contract to run the stadium for ten years. The company which already operates several other stadiums, including the Stade de France in Paris, had reportedly beaten off competition from other companies including Anschutz Entertainment Group who run The O2. In February 2015, Vinci Stadium, a subsidiary of Vinci Concessions, were appointed to manage the stadium starting in April 2015 for a 25-year period. The company will also be responsible for the London Marathon Charitable Trust Community Track and events on the south park lawn. This is the first stadium outside France to be managed by Vinci. Although West Ham United are the primary tenants, the stadium operators arrange many other events for the stadium. Charles Sale reported in the Daily Mail during December 2012 that the London Legacy Development Corporation were keen to take financial advantage by hosting events in the stadium due to the work to convert the stadium not starting until autumn 2013. On 24 January 2013, it was confirmed that the London Athletics Grand Prix, a Diamond League event, would be switched to the stadium. In February 2013, it was announced that after the stadium would also hold a Paralympic athletics event on 28 July. In April Sainsbury's were announced as sponsors and the event was renamed the "Anniversary Games". The London Grand Prix was scheduled to move permanently to the stadium in 2016. However, due to the 2015 Rugby World Cup taking place in the stadium, using the original seating configuration, the opportunity came to move the Grand Prix to the stadium a year early, again under the name of the Anniversary Games. During the 2015 events national records were set by Dafne Schippers (100 m), Dina Asher-Smith (100 m), Shara Proctor(long jump), while Georgina Hermitage (400 m T37) and Sophie Hahn (100 m T38) set world records. The Muller Anniversary Games, the fourth anniversary event, took place in the stadium on 22–23 July 2016. The IPC Grand Prix events were incorporated alongside Diamond League events on the second day of the meet. The London meet is the only Diamond League meeting to date to span two consecutive days. The 2018 Muller Anniversary Games returned to a two-day event on its typical weekend of 21–22 July. London had bid to host the 2015 World Athletics Championships using the Olympic Stadium. It went up against Beijing's Olympic Stadium and the Polish city of Chorzów. However, the stadium had to withdraw their bid due to uncertainties arising out of the timing of the announcement of who would operate the stadium after the Olympics, thus gifting Beijing the championships. With issues resolved over the stadium's future, London again used the stadium to bid for the 2017 World Athletics Championships. The bid was made official in August with Lord Coe personally submitting the bid a few weeks later at the 2011 World Athletic Championships in Daegu which was supported by London's Mayor Boris Johnson and the British Government. On 11 November 2011, the IAAF officially awarded the 2017 World Championships to London. The World Para Athletics Championships (formerly the IPC Athletics World Championships) were planned to take place a month before the able-bodied event and were formally confirmed for the stadium in December 2012. The 2017 able-bodied athletics event was the final track championship for Mo Farah and Usain Bolt. The World Para Athletics Championships were held between 14–23 July 2017, with 800,000 tickets available across 16 sessions. The IAAF World Championships followed between 4–13 August 2017 with 700,000 tickets available. 3,300 athletes from 200 countries competed for 690 medals across 245 events. In February 2018, London Stadium was announced as the venue for the inaugural Athletics World Cup. The event was held on 14 and 15 July. West Ham United play at this stadium, having moved from their former Boleyn Ground in August 2016. The club announced in March 2013 that the stands behind the goals will be named after former players Bobby Moore and Trevor Brooking; there were stands at the Boleyn Ground named after them. West Ham sold out the 50,000 season ticket allocation for the stadium by May 2016 for the 2016–17 season. The opening game for West Ham was a Europa League match against NK Domžale on 4 August 2016, which West Ham won 3–0 with the stadium sold out, albeit with a reduced capacity of 54,000 as conversion works were still being finished. The official opening match was a friendly with Juventus on 7 August with a 2–3 defeat. West Ham's first Premier League match at the stadium was against Bournemouth with an attendance of 56,977. Watford were the first Premier League side to beat West Ham at the London Stadium, overcoming a two-goal deficit to beat West Ham 4–2. In February 2019, it was announced that the East Stand would be renamed in honour of Billy Bonds. At the beginning of the 2016–17 season, West Ham's games were marred by instances of crowd trouble. Against Bournemouth on 21 August some fans arrived with tickets for seats that did not exist. Fighting also occurred between rival supporters outside the stadium. On 26 August during a Europa League game against FC Astra Giurgiu fighting broke out in the stadium with a supporter being arrested on suspicion of causing ABH. Against Watford, rival fans fought following poor crowd segregation. On 1 October 2016, against Middlesbrough three people were arrested as violent clashes occurred. On 22 October 2016, against Sunderland rival fans confronted each other as Sunderland fans returned to transport taking them home. By 25 October 2016, 23 banning orders had been issued to fans with nine arrests. There was further crowd trouble on 26 October 2016 during West Ham's EFL Cup fourth-round game against London rivals, Chelsea. Seven people were arrested as police introduced a ban on the sale of alcohol. Plastic bottles, seats and coins were thrown during West Ham's 2–1 victory. Hundreds of supporters clashed and riot police entered the concourse. West Ham vice-chairman Karren Brady said any supporter identified as having taken part in the violence would receive a lifetime ban. MP Mark Field called for West Ham to play behind closed doors should any further violence occur. In October 2016, football stadium design expert, Paul Fletcher said that the stadium should be pulled down and rebuilt as in its current design it was not right for football fans as they were too far from the pitch. In December 2016, a cameraman working for Arsenal TV was punched in the face by a West Ham supporter towards the end of West Ham's 1–5 defeat by Arsenal. In March 2018, there were protests against West Ham United owner, David Sullivan at the stadium during a 3-0 home defeat to Burnley. There were four pitch invasions and Sullivan was escorted from his seat before the end of the match. Sullivan was also hit on the head by a coin thrown by one of the supporters. Karren Brady called the events "one of the most painful days" in the club's history. Following the crowd trouble, West Ham banned five supporters for life for invading the pitch. Several people who had thrown coins and other objects were also given lifetime bans. Calling the scenes at the stadium a "disgrace", London mayor, Sadiq Khan said that the crowd trouble had been organised and co-ordinated. Investigation had revealed that over a dozen fights had broken out in the ground between West Ham supporters and that 26 people had attempted to invade the pitch with twenty-two being stopped by stewards. There were 150 separate incidents, including 50 public order offences and 40 assaults. CCTV footage shows a co-ordinated move by a known group of individuals towards the directors' box. Measures including increased security presence and preventing fans approaching the area holding members of the West Ham board were announced in late March. Entirely funded by the UK taxpayer and costed at £60,000, the provisions were planned for the next game, against Southampton. 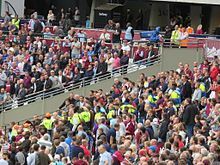 In June 2018, West Ham were charged by the FA with offences relating to crowd disturbances at the game against Burnley in March. On 31 October 2018, during West Ham's EFL Cup game against Tottenham Hotspur, further pitch invasions took place with one invader wearing a Scream mask. In January 2019, West Ham were fined £100,000 following the disturbances in the match against Burnley in March 2018. In an attempt to make the London Stadium more like their home ground, in April 2019 a £250,000 claret-coloured pitch surround was announced. In May 2014 it was announced that the Essex Eagles had agreed a deal in principle to play Twenty20 cricket matches at the stadium. The venue was also touted as a possible venue for the 2019 Cricket World Cup.. However, the venue was not included in the final fixtures list. The stadium was not chosen due to the existing facilities running east to west which would have made the game difficult to watch, as at most cricket venues the pitch runs north to south. When investigation took place by the time they turned everything to a north-south axis the capacity of the stadium would have decreased by 30,000. The International Cricket Council additionally had concerns over potential serious injuries to players caused by the raised sand based outfield. On 8 May 2018, Major League Baseball announced a two-year deal to host a series of baseball games at London Stadium in 2019 and 2020. The Boston Red Sox and New York Yankees (a major rivalry in the league) will play a two-game series at London Stadium from 29-30 June 2019, branded as the MLB London Series. In its baseball configuration, the stadium will have a capacity of 60,000; plans were prepared to adjust the stadium's seating to emulate the "intimate" experience and amenities of American baseball stadiums, as well as constructing larger locker rooms akin to the clubhouses of U.S. parks. A new playing surface will be overlaid on top of the stadium's existing grass. In November 2015 the stadium hosted the 2015 Race of Champions event. It was the first occasion since 2008 that Great Britain hosted the event, with Wembley Stadium last staging the contest in 2008. The English team of Andy Priaulx and Jason Plato won the nations cup whilst Sebastian Vettel took the Champion of Champions crown. The first Rugby league match at the stadium was played between England and New Zealand on 7 November 2015, in front of 44,000 spectators. The match was the second test of a three-test series between the sides. The venue also hosted the match between England and Australia as part of the 2016 Rugby League Four Nations (att: 36,000). In June 2016, it was announced that the Stadium will form part of England's bid to host the 2021 Rugby League World Cup. In July 2012 the Olympic Park Legacy Company submitted a bid to England Rugby 2015 to host some matches of the 2015 Rugby World Cup. On 2 May 2013, it was officially announced that the Olympic Stadium was due to host four Pool matches during the World Cup and the Bronze final. The first rugby union match at the stadium took place on 29 August 2015 as part of a testing programme ahead of the World Cup. The match featured the first ever game between the invitational Barbarians side and Samoa. The Barbarians won 27–24, with Samoa having Kane Thompson sent off for punching. The game was delayed when pitch sprinklers came on during the first half. 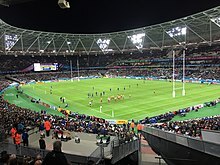 At fixture launch on 7 July 2017, it was announced that Saracens would host their annual Derby Day clash against Harlequins at the London Stadium on 24 March 2018. This was the first time since 2010 that this fixture did not take place at Wembley. The match ended in a 24-11 win for Saracens in front of a crowd of 55,329 and was the first ever Premiership Rugby match at the stadium. Both teams would return to the stadium the following year in a repeat of the fixture which ended as a 27-20 win for Saracens in front of a crowd of 42,717. 4 June 2016 AC/DC feat. Axl Rose Tyler Bryant & The Shakedown Rock or Bust World Tour 65,000 First concert at the stadium since its redevelopment following the 2012 Olympic and Paralympic Games. Jay-Z TBA On the Run II Tour Beyoncé became the first female headliner to perform at the stadium. The stadium is located in the south of Queen Elizabeth Olympic Park. Stratford and Stratford International railway stations are the main stations nearest to the Olympic Park, and are roughly a 20-minute walk to the stadium. Stratford International is served by Southeastern trains on High Speed 1 offering four trains per hour to St Pancras International, as well as other services to Kent, while Stratford station has London Overground services to North, West and South London, and is on the Great Eastern Main Line to London Liverpool Street and East Anglia. Stratford is on London Underground's Jubilee and Central lines to Central London and the Docklands Light Railway (DLR). The DLR offers a direct service to London City Airport. In addition, Hackney Wick (London Overground) and Pudding Mill Lane (DLR) serve the stadium, but may be closed during bigger events due to capacity limitations. From 2019 the stadium will be served by Crossrail. Travellers by car are advised to use the public car parks at Westfield Stratford City, Stratford International station and the Stratford Centre. The Queen Elizabeth Olympic Park also has several docking stations for the London Cycle Hire scheme. A further 17 services use Stratford bus station and Stratford City bus station, which offer a network of services across East London. In addition, route 25 from City Thameslink serves Central London. National Express coach services to Stratford bus station provide a direct connection to Stansted Airport and several other routes to Essex and East Anglia. ^ "London Stadium capacity clarification". West Ham United F.C. ^ a b "London 2012: Inside track on Olympic running surface". BBC News. Retrieved 23 November 2014. ^ a b "London 2012 Olympic Stadium Athletics Track Completed". BBC Sport. 3 October 2011. Retrieved 14 May 2012. ^ Gibson, Owen (18 July 2015). "Inside West Ham's new home: how football came to 2012's Olympic July Stadium". The Guardian. Retrieved 28 December 2016. ^ It is located in the Lower Lea Valley, 6 miles (10 km) east of central London. ^ a b "London 2012: Olympic Park runners finish race". BBC News. 31 March 2012. Retrieved 7 February 2013. ^ "New Stadium capacity increased to 60,000". West Ham United F.C. Retrieved 24 March 2016. ^ "London reveals Olympic Park Plans". BBC News. Retrieved 13 September 2015. ^ "Hammers keen on Olympic move". BBC News. Retrieved 13 September 2015. ^ "Eggert targets top four – and life away from Upton Park". London Evening Standard. Retrieved 13 September 2015. ^ "Negotiations Start with Arsenal Stadium Team". London 2012. 13 October 2006. Archived from the original on 10 February 2007. Retrieved 19 December 2007. ^ Kernon, Sophie; McGee, Brian (16 October 2006). "Sir Robert McAlpine Chosen to Build London's Olympic Stadium". Bloomberg. Archived from the original on 25 September 2013. Retrieved 25 August 2013. ^ "Olympic stadium work starts early". BBC News. 22 May 2008. Retrieved 25 August 2013. ^ "Olympic Stadium work starts early". BBC News. 11 March 2008. Retrieved 25 August 2013. ^ Pearce, Nick (29 March 2011). "London 2012 Olympics: Olympic Stadium completed 'on time and under budget'". The Daily Telegraph. Retrieved 25 August 2013. ^ Spring, Martin (5 September 2008). "On Your Marks: Countdown to 2012, London's Olympic Stadium". Building. Retrieved 19 October 2008. ^ "Olympic Stadium 2012". London Olympic Stadium. Archived from the original on 27 February 2012. ^ "PVC at Olympics destined for reuse or recycling". waste recycling news. Archived from the original on 8 December 2012. Retrieved 20 August 2012. ^ Radnedge, Aidan. "Why Plymouth Argyle and Dartford FC Are Top of Eco-Friendly League Table". Metro. Retrieved 11 March 2012. ^ (registration required) Kortekaas, Vanessa (4 August 2011). "Dow Chemical Wraps Up Olympic Deal". Financial Times. Retrieved 4 August 2011. ^ (registration required) Olcayto, Rory (29 May 2008). "Olympic Stadium's Latest Design Unveiled". Bdonline.co.uk. Retrieved 6 August 2011. ^ a b c d "London 2012: Ten facts about the Olympic Stadium". BBC News. Retrieved 23 November 2014. ^ "Delivering London 2012: the Olympic Stadium". Institution of Civil Engineering. Archived from the original on 17 September 2018. Retrieved 10 March 2012. ^ "London Unveils 2012 Stadium Plan". BBC News. 7 November 2007. Retrieved 5 August 2008. ^ "London 2012 Olympic stadium floodlights switched on – BBC News". BBC. Retrieved 30 September 2015. ^ 27 November 2013 at (27 November 2013). "Olympic stadium floodlights finally lose their dazzle | London – ITV News". Itv.com. Retrieved 30 September 2015. ^ a b "The Stadium | London Legacy Development Corporation". Londonlegacy.co.uk. Archived from the original on 10 September 2012. Retrieved 25 September 2012. ^ "Final turf laid at London Olympic 2012 Stadium". BBC News. Retrieved 23 November 2014. ^ "MONDO News". Mondotrack.com. Retrieved 30 September 2015. ^ mirror Administrator. "London 2012: Olympics stadium facts and figures". mirror. Retrieved 23 November 2014. ^ Prigg, Mark (31 July 2012). "The lights fantastic: How Danny Boyle used 'paddles' with tiny bulbs to turn Olympics audience into a giant video screen". Daily Mail. London. Retrieved 13 September 2012. ^ Martins, Alejandra. "London 2012: Inside track on Olympic running surface – BBC News". BBC. Retrieved 30 September 2015. ^ "IAAF: Athletes in London will sample Rio's Olympic track surface| News | iaaf.org". iaaf.org. Retrieved 9 January 2017. ^ London Olympic Stadium Divides Opinion". The Sydney Morning Herald. Retrieved 12 December 2007. ^ HOK's 2012 "Olympic Stadium Design Revealed – Images and Slideshow. Building Design. Retrieved 12 December 2007. ^ "Olympic Stadium Is Deflated Architecture at an Inflated Price". The Times. Retrieved 12 December 2007. ^ Thorpe, Vanessa (22 July 2012). "Olympic Stadium is in the running for Stirling prize gold". The Observer. London. Retrieved 25 August 2012. ^ Youngs, Ian (14 October 2012). "Sainsbury Laboratory wins Stirling architecture prize". BBC News. Retrieved 19 October 2012. ^ "Stadium Disappoints All Round". Building Design. Retrieved 12 December 2007. ^ "Education | Inflation Calculator". Bank of England. Archived from the original on 24 March 2009. Retrieved 6 August 2011. ^ "Boaters Preview Queen Elizabeth Olympic Park's Waterways". Archived from the original on 29 November 2014. Retrieved 23 November 2014. ^ Oliver Wainwright (6 April 2011). "London 2012 Olympic stadium by Populous". Building Design. Retrieved 23 November 2014. ^ "Olympic Stadium will not reopen until August 2015 at the earliest". BBC News. 7 November 2012. Retrieved 16 January 2013. ^ "Olympic Stadium's feature secured in historic deal between Mayor's Legacy Corporation, Newham Council and West Ham United football club". London Legacy Development Corporation. 22 March 2013. Archived from the original on 27 September 2013. Retrieved 19 August 2013. ^ a b Bryan, Lee (29 March 2013). "So what are West Ham going to do to change the Olympic Stadium? New plans are revealed here". Daily Mail. ^ William, Helen (29 May 2013). "Green light for Olympic Stadium makeover". The Independent. London. Retrieved 18 June 2013. ^ "Stadium conversion approved". West Ham United F.C. 28 May 2013. Archived from the original on 15 June 2013. Retrieved 18 June 2013. ^ "Balfour Beatty awarded £154 million Queen Elizabeth Olympic Park Stadium transformation contract". Balfour Beatty. 6 January 2014. ^ "Balfour Beatty lands £154m London Olympic Stadium conversion contract". The Independent. Retrieved 23 November 2014. ^ "Construction Manager". Retrieved 23 November 2014. ^ "Olympic Stadium contracts awarded in a major legacy milestone". London Legacy Development Corporation. 25 July 2013. Archived from the original on 25 September 2013. Retrieved 19 August 2013. ^ Rossingh, Danielle (25 July 2013). "Boris Johnson Awards $103Mln in Olympic Stadium Contracts". Bloomberg. Retrieved 19 August 2013. ^ "Exclusive: Olympic Stadium Bill May Rise £15m". Sky News. Retrieved 23 November 2014. ^ Owen Gibson. "Olympic Stadium costs soar to more than £600m after roof complications". The Guardian. Retrieved 23 November 2014. ^ "Olympic Stadium cost soars beyond £600m as LLDC agrees to pay further £35.9m". SkySports. Retrieved 23 November 2014. ^ "Transformation work begins for iconic Stadium on Queen Elizabeth Olympic Park". London Legacy Development Corporation. 13 August 2013. Archived from the original on 17 August 2013. Retrieved 19 August 2013. ^ Atwal, Kay (14 August 2013). "Transformation of Stadium at Queen Elizabeth Olympic Park begins". Newham Recorder. Retrieved 24 August 2013. ^ "New chapter for Olympic Stadium as preparations for its multi use future begin". Archived from the original on 19 October 2014. Retrieved 23 November 2014. ^ "Olympic Stadium to have roof fitted before West Ham move in". The Independent. London. 20 November 2013. Retrieved 21 November 2013. ^ Mark Shales. "Work starts on 14 new floodlight towers at former Olympic Stadium". Newham Recorder. Retrieved 30 September 2015. ^ "Your Claret and Blue seats are coming! – West Ham United". Retrieved 14 May 2016. ^ "New Stadium progress report". West Ham United FC. Retrieved 24 June 2016. ^ "Mark Noble shows West Ham dedication as midfielder battles UK floods for club shop's grand opening". Daily Mirror. Retrieved 24 June 2016. ^ "Stadium in Queen Elizabeth Olympic Park to become new national centre for athletics". Athletics Weekly. Retrieved 23 November 2014. ^ "The future of the Stadium". Archived from the original on 31 October 2014. Retrieved 23 November 2014. ^ Danielle Rossingh (23 July 2013). "Olympic Stadium New Home of U.K. Athletics for 50 Years". Bloomberg L.P. Retrieved 23 November 2014. ^ "MAJOR LEGACY MILESTONE IN TRANSFORMATION OF THE STADIUM AT QUEEN ELIZABETH OLYMPIC PARK". Archived from the original on 31 October 2014. Retrieved 23 November 2014. ^ "Opportunity of a lifetime! University athletes set to test Olympic venues in competition". Daily Mail. London. 24 February 2011. Retrieved 15 August 2013. ^ "Olympic Stadium test event to be held in May". BBC. 26 April 2012. Retrieved 15 August 2013. ^ "Olympic Stadium to host evening of entertainment". IPC. 13 March 2012. Retrieved 15 August 2013. ^ "Olympic Stadium is officially opened". BBC News. 6 May 2012. Retrieved 15 August 2013. ^ "Whitehead, Cockroft and Blake celebrate new World Records". British Athletics. 8 May 2012. Archived from the original on 11 January 2016. Retrieved 19 August 2013. ^ "Olympic Park to host School Games". BBC News. 7 October 2011. Retrieved 15 August 2013. ^ "School Games set to continue 2012 build-up". BBC News. 6 May 2012. Retrieved 15 August 2013. ^ "London 2012 Opening and Closing Ceremony". International Olympic Committee. Retrieved 7 May 2014. ^ Rostance, Tom (9 August 2012). "David Rudisha breaks 800m world record in Olympics win". BBC Sport. Archived from the original on 8 November 2012. Retrieved 15 August 2013. ^ Fordyce, Tom (11 August 2012). "Usain Bolt wins third gold in Jamaica 4x100m relay victory". BBC News. Retrieved 15 August 2013. ^ Sheringham, Sam (10 August 2012). "USA smash world 4x100m relay record to win Olympic gold". BBC News. Retrieved 15 August 2013. ^ "World Records Ratified". IAAF. 7 November 2012. Retrieved 15 August 2013. ^ Fordyce, Tom (5 August 2012). "Usain Bolt wins Olympics 100m final at London 2012". BBC News. Archived from the original on 5 August 2012. Retrieved 15 August 2013. ^ Sheringham, Sam (10 August 2012). "Pole vaulter Renaud Lavillenie breaks record". BBC News. Archived from the original on 13 November 2013. Retrieved 15 August 2013. ^ Fordyce, Tom (7 August 2012). "Sally Pearson takes 100m hurdles gold". BBC News. Retrieved 15 August 2013. ^ "Tatyana Lysenko in record throw". BBC News. 10 August 2012. Retrieved 15 August 2013. ^ White, Jim (29 August 2012). "Paralympics 2012: Hawking opens ceremony with a 'Big Bang'". The Daily Telegraph. Retrieved 7 May 2014. ^ Jones, David (9 September 2012). "Para, Para, Paralympics! Coldplay rock the Games Closing Ceremony as they are joined by Rihanna to sing farewell to spectacular summer of sport". Daily Mail. Retrieved 7 May 2014. ^ a b c d e f "Gold medal glory for Whitehead on Day 3". International Paralympic Committee. 1 September 2012. Retrieved 20 August 2013. ^ a b c d e f "Brazilian sprinters go 1–2–3". International Paralympic Committee. 5 September 2012. Retrieved 20 August 2013. ^ a b c d e f g h "Peacock, Weir, van Rhijn, Campbell all take gold". International Paralympic Committee. 6 September 2012. Archived from the original on 11 November 2013. Retrieved 20 August 2013. ^ a b c d "McFadden finally gets her gold". International Paralympic Committee. 3 September 2012. Retrieved 20 August 2013. ^ a b c d e f g h i j k "Athletics events come to a close". International Paralympic Committee. 8 September 2012. Archived from the original on 20 August 2013. Retrieved 20 August 2013. ^ a b c d e f g h i j k "Smyth, McKillop, O'Hanlon, Stilwell light up Olympic Stadium". International Paralympic Committee. 1 September 2012. Retrieved 20 August 2013. ^ a b c d e f "Weir does it again on track". International Paralympic Committee. 4 September 2012. Archived from the original on 11 November 2013. Retrieved 20 August 2013. ^ a b "Record defying opening day for Athletics". International Paralympic Committee. 31 August 2012. Retrieved 20 August 2013. ^ a b c d e f g h "Popow gets his sprinting gold". International Paralympic Committee. 8 September 2012. Archived from the original on 11 November 2013. Retrieved 20 August 2013. ^ "Weir closes night with historic finish". International Paralympic Committee. 3 September 2012. Retrieved 20 August 2013. ^ "Repeat success for China's Na Mi". International Paralympic Committee. 6 September 2012. Archived from the original on 11 November 2013. Retrieved 20 August 2013. ^ a b "O'Hanlon nabs the double". International Paralympic committee. 8 September 2012. Archived from the original on 11 November 2013. Retrieved 20 August 2013. ^ a b c d "Rehm shines in long jump at Olympic Stadium". International Paralympic Committee. 31 August 2012. Archived from the original on 11 November 2013. Retrieved 20 August 2013. ^ a b c d e "Men's shot put takes centre stage on Day 7". International Paralympic Committee. 5 September 2012. Retrieved 20 August 2013. ^ a b c "Repeat success for China's Na Mi". Paralympic.org. Retrieved 19 December 2013. ^ a b c d e "Australia's Cartwright jumps for joy". International Paralympic Committee. ^ a b c "Wang wraps up field hat trick". International Paralympic Committee. Retrieved 19 December 2013. ^ "China's Yao shot to the top of the podium". International Paralympic Committee. ^ "State aid – Detailed guidance". Government of the United Kingdom. Retrieved 30 September 2015. ^ "Lawrence, S. (2012) TFEU – State Aid and Sporting Legacy Facilities within the European Union. International Sports Law Journal 2012 1–2 40–41" (PDF). Retrieved 2 February 2015. ^ "London 2012 Olympics: Stadium not 'white elephant' says Hugh Robertson as West Ham confirm new bid". The Daily Telegraph. 11 October 2011. ^ a b "2012 Stadium Bid Collapsed". ESPN Soccernet. 11 October 2011. ^ "Tottenham demand to know if goalposts shifted during bidding for Olympic Stadium". The Daily Telegraph. Retrieved 16 September 2015. ^ "London 2012 Olympic Games Stadium Bidding Begins". BBC News. 18 August 2010. Retrieved 18 August 2010. ^ "Tottenham and West Ham Lead London 2012 Stadium Bid". BBC News. 12 November 2010. ^ Pringle, Derek (3 November 2009). "Cricket Would Be a Bad Fit for Post-London 2012 Olympic Stadium". The Daily Telegraph. ^ "London's Olympic Stadium a Potential T20 Venue". ESPNcricinfo. Retrieved 6 August 2011. ^ "Essex Ponder Olympic Stadium Use". BBC News. 15 April 2010. Retrieved 20 May 2010. ^ "Improved Bid May Tempt Wasps into Olympic Stadium". Archived from the original on 3 February 2009. Retrieved 19 October 2008. ^ "Olympic Board Statement on the Olympic Stadium". London Organising Committee of the Olympic Games and Paralympic Games Ltd. Archived from the original on 8 August 2007. Retrieved 19 October 2008. ^ "2012 Chief Makes Stadium Demand". BBC News. 8 October 2008. Retrieved 19 October 2008. ^ "MLB Eyeing London's Olympic Stadium for Games". Sports Illustrated. 28 March 2011. Retrieved 30 March 2012. ^ "Olympic Stadium's grand designs post-2012 ... before West Ham emerged as bid winners". The Daily Telegraph. London. 10 February 2011. Retrieved 27 July 2012. ^ "Hammers' Olympic Move Ruled Out". BBC News. 7 February 2007. Retrieved 7 February 2007. ^ "Olympic Stadium now first choice for Tottenham". The Guardian. 5 October 2010. ^ "Tottenham maintain Olympic stadium interest is 'deadly serious'". The Guardian. 25 November 2010. ^ "Gold and Sullivan Take Over West Ham". Archived from the original on 17 July 2012. Retrieved 19 January 2010. ^ "West Ham's Grounds for Optimism over Olympic Stadium". BBC Sport. 18 August 2010. Retrieved 18 August 2010. ^ "Orient Challenge Stadium Decision". BBC News. 16 February 2011. ^ "West Ham Approved as London 2012 Olympic Stadium Tenant". BBC News. 3 March 2011. ^ Kirk, Tristan (25 June 2011). "Spurs Judicial Review Bid over Olympic Stadium Rejected by Judge". Haringey Independent. Archived from the original on 25 March 2012. Retrieved 13 May 2012. ^ "Spurs Lodge Fresh Stadium Appeal". BBC News. 29 June 2011. ^ "London 2012: OPLC Reviews Olympic Stadium Bid Process". BBC News. Retrieved 16 July 2011. ^ "2012 Stadium Bid Not Compromised". BBC News. 22 August 2011. ^ "Tottenham 'To Drop 2012 Olympic Stadium Legal Bid'". BBC News. 23 August 2011. ^ "Spurs Win Right To Challenge 2012 Stadium Decision". BBC News. 24 August 2011. ^ "Coe Calms Fears over Worlds Bid". BBC News. 25 August 2011. ^ Wilson, Neil (8 June 2011). "London 2012 Olympics: Coe Insists Track Will Stay at Olympic Stadium". Daily Mail. Retrieved 6 August 2011. ^ Gold, David (31 January 2012). "West Ham Among 16 Interested in London 2012 Olympic Stadium as Deadline Passes". insidethegames. ^ "Tottenham Hotspur ends 2012 Olympic Stadium legal bid". 17 October 2011. ^ "Olympic Stadium wanted by West Ham United and 15 other parties". BBC. 1 February 2012. Retrieved 25 September 2012. ^ "F1 track plan among Olympic Stadium bids". BBC Sport. 17 July 2012. ^ Kelso, Paul; Cary, Tom (22 June 2012). "London 2012 Olympics: plan to hold Formula One race in and around Olympic Stadium on bid shortlist". The Daily Telegraph. ^ "Essex CCC make joint Olympic Stadium bid". BBC Sport. 30 March 2012. Retrieved 25 August 2012. ^ "Mayor to take over Park legacy planning". BBC. 8 February 2012. Retrieved 25 September 2012. ^ Kelso, Paul (12 September 2012). "London 2012 Olympics: Boris Johnson to take control of stadium legacy as Daniel Moylan loses job". The Daily Telegraph. Retrieved 25 September 2012. ^ "West Ham United are preferred bidder for Olympic Stadium". BBC News. 5 December 2012. Retrieved 16 January 2013. ^ a b Owen Gibson (5 December 2012). "West Ham given three months to seal Olympic Stadium bid". The Guardian. London. Retrieved 21 March 2013. ^ Bond, David (5 December 2012). "West Ham given ultimatum over Olympic Stadium deal". BBC Sport. Retrieved 16 January 2013. ^ David Bond (5 December 2012). "The future of the Olympic Stadium remains far from resolved". BBC Sport. Retrieved 16 January 2013. ^ West Ham (11 February 2013). "West Ham United move closer to securing Olympic Stadium deal with breakthrough agreement". The Daily Telegraph. London. Retrieved 21 March 2013. ^ Riach, James (18 February 2013). "West Ham's move to Olympic Stadium stalls again over approval process". The Guardian. London. Retrieved 21 March 2013. ^ "West Ham closing on Olympic Stadium deal – David Gold". BBC News. 4 March 2013. Retrieved 21 March 2013. ^ "West Ham receive 99-year lease for Olympic Stadium". stadiumguide.com. 24 March 2013. Retrieved 28 July 2013. ^ "Athletics in 50-year Olympic stadium deal coup". London Evening Standard. 24 July 2013. Retrieved 15 August 2013. ^ "New deal secures athletics legacy on Queen Elizabeth Olympic Park". Archived from the original on 29 November 2014. Retrieved 23 November 2014. ^ Gibson, Owen (26 April 2013). "Barry Hearn faces Olympic Stadium defeat after rejection of review". The Guardian. ^ Rumsby, Ben (19 April 2013). "Barry Hearn says Orient will continue to fight for the right to share the Olympic Stadium". The Daily Telegraph. London. ^ "Leyton Orient chairman Barry Hearn defiant". BBC News. 13 June 2013. Retrieved 19 August 2013. ^ "Leyton Orient lose Olympic Stadium tenancy review bid". BBC News. 19 September 2013. Retrieved 19 September 2013. ^ Richards, Chris (18 November 2013). "Peers say Leyton Orient SHOULD be allowed to use the Olympic Stadium". Daily Mirror. ^ "Olympic Stadium 'not being used to the full' – Lords report". BBC London. 19 November 2013. ^ Conway, Richard (18 November 2013). "London 2012: Lords report warns of faltering Olympic legacy". BBC Sport. ^ Gibson, Owen. "Olympic Stadium gutted as conversion of new home for West Ham begins". The Guardian. Retrieved 19 December 2013. ^ Rumsby, Ben (18 December 2013). "Leyton Orient could share Olympic Stadium with West Ham as Barry Hearn is cleared to strike rental deal". The Daily Telegraph. London. Retrieved 19 December 2013. ^ Ziegler, Martyn (14 December 2013). "Leyton Orient could rent Olympic Stadium – and there's nothing West Ham can do about it, claims Barry Hearn". The Independent. London. Retrieved 19 December 2013. ^ "Olympic Stadium: New details on West Ham deal revealed". BBC Sport. Retrieved 10 October 2015. ^ "West Ham at the Olympic Stadium: My dog could've done a better deal – Barry Hearn". BBC Sport. 14 April 2016. Retrieved 15 April 2016. ^ "West Ham: London Stadium rent 'does not even cover cost of matches', owners say". 6 September 2018. Retrieved 23 January 2019 – via www.bbc.co.uk. ^ "West Ham to go to court in London Stadium capacity battle worth £100m". London Evening Standard. 13 March 2018. Retrieved 10 April 2019. ^ "West Ham settle London Stadium dispute with landlords at last minute". BBC. 19 November 2018. Retrieved 10 April 2019. ^ "French firm Vinci leads the race to run Olympic Stadium". London Evening Standard. Retrieved 23 November 2014. ^ "New milestone for our new stadium". West Ham United F.C. 3 February 2015. Archived from the original on 3 February 2015. Retrieved 3 February 2015. ^ Shales, Mark (4 February 2015). "French construction firm to run Olympic Stadium for 25 years". Newham Recorder. Retrieved 7 February 2015. ^ "MAYOR ANNOUNCES VINCI APPOINTED AS OPERATOR FOR FORMER OLYMPIC STADIUM". Queen Elizabeth Olympic Park. 3 February 2015. Archived from the original on 6 February 2015. Retrieved 7 February 2015. ^ Sale, Charles (6 December 2012). "Diamond League meeting could be held at Olympic Stadium". Daily Mail. London. Retrieved 16 January 2013. ^ "Olympic Stadium to host Diamond League meeting". BBC News. 24 January 2013. Retrieved 21 March 2013. ^ Hart, Simon (13 February 2013). "Paralympic action added to London Anniversary Games at the 2012 Olympic Stadium in July". The Daily Telegraph. Retrieved 19 February 2013. ^ "Sainsburys's confirmed as major British Athletics sponsor". UK Athletics. 15 April 2013. Archived from the original on 19 April 2013. Retrieved 15 August 2013. ^ Hart, Simon (15 April 2013). "Sainsbury's announced as sponsor of Anniversary Games at Olympic Stadium after agreeing deal with UK Athletics". The Daily Telegraph. London. Retrieved 15 August 2013. ^ Majendie, Matt (27 January 2015). ""Olympic Stadium is athletics' venue... not West Ham's" – UK Athletics chief De Vos has big plans for iconic arena". London Evening Standard. Retrieved 7 February 2015. ^ "Farah back in former Olympic Stadium to launch the London leg of the 2015 IAAF Diamond League". iaaf.org. Retrieved 30 September 2015. ^ Mark Shales. "Mo Farah launches third Sainsbury's Anniversary Games at Olympic Stadium". Newham Recorder. Retrieved 30 September 2015. ^ Etchells, Daniel (26 February 2015). "London 2012 Olympic Stadium to host IPC Athletics Grand Prix Final". Insidethegames.biz. Retrieved 30 September 2015. ^ "London's former Olympic Stadium set to host Grand Prix Final". International Paralympic Association. 26 February 2015. Retrieved 27 February 2015. ^ "100m Schippers Asher-Smith London". iaaf.org. Retrieved 30 September 2015. ^ "Renaud Lavillenie London IAAF Diamond League". iaaf.org. Retrieved 30 September 2015. ^ "Hahn and Hermitage break world records in London". Paralympic.org. 26 July 2015. Retrieved 30 September 2015. ^ "See Mo Farah at the Muller Anniversary games 09.07.17 | London Athletics (England Athletics) | Track & Field, Disability Athletics, Coaching, Officials Volunteering". www.londonathletics.org. Retrieved 8 January 2017. ^ "London Pulls Out of 2015 World Athletics Race". BBC Sport. 4 November 2010. Retrieved 16 July 2012. ^ "UK Bids To Host 2017 World Athletics Championships". BBC Sport. 11 March 2011. Retrieved 16 July 2012. ^ "London Bids To Host 2017 World Athletics Championships". BBC Sport. 18 August 2011. Retrieved 16 July 2012. ^ "London selected to host 2017 IAAF World Championships". International Association of Athletics Federations. 11 November 2011. Retrieved 16 January 2013. ^ Hart, Simon (18 October 2012). "Olympic Stadium set to host 2017 World Paralympic Championships". The Daily Telegraph. London. ^ "London named host city for 2017 Paralympic World Championships". BBC sport. 19 December 2012. Retrieved 19 December 2012. ^ "World Championships 2017: Mo Farah defends his 10,000m title in London". BBC. 4 August 2017. ^ "World Championships 2017: Usain Bolt beaten by Justin Gatlin in 100m final". BBC. 5 August 2017. ^ "World Championships in Athletics | Summer of World Athletics". www.london2017athletics.com. Retrieved 8 January 2017. ^ Association, Press (5 February 2018). "London Stadium to host new athletics World Cup in July". Retrieved 23 January 2019 – via www.theguardian.com. ^ McLeman, Neil (22 March 2013). "Capital gains: Boris hails Olympic Stadium move as 'a great deal for West Ham and London'". Daily Mirror. ^ Bond, David (22 March 2013). "West Ham get Olympic Stadium after government ups funding". BBC Sport. ^ "Olympic Stadium: West Ham sell out over 50,000 season tickets for next season". BBC Sport. 9 May 2016. Retrieved 24 June 2016. ^ Long, Sam. "West Ham confirm Europa League third qualifying round fixture date reversed by Uefa". London Evening Standard. Retrieved 21 July 2016. ^ Steinberg, Jacob. "Cheikhou Kouyaté sets West Ham's Olympic record in win over Domžale". The Guardian. Retrieved 5 August 2016. ^ "West Ham mark official London Stadium opening with Juventus defeat". BBC Sport. 7 August 2016. Retrieved 23 August 2016. ^ Hafez, Shamoon (21 August 2016). "West Ham United 1 AFC Bournemouth 0". BBC Sport. Retrieved 23 August 2016. ^ "West Ham United 2–4 Watford". BBC. 10 September 2016. Retrieved 20 September 2016. ^ "Hornets come from behind to secure astonishing West Ham win". Retrieved 20 September 2016. ^ "West Ham: Billy Bonds gets London Stadium stand named after him". BBC Sport. 6 February 2019. Retrieved 10 February 2019. ^ "Arrests after West Ham v Middlesbrough violence". BBC Sport. 2 October 2016. Retrieved 25 October 2016. ^ "West Ham condemn stadium violence". Sky Sports. Retrieved 26 October 2016. ^ "Middlesbrough fans attacked after West Ham game at London Stadium". The Telegraph. 1 October 2016. Retrieved 25 October 2016. ^ "Sunderland fans 'feared for their safety' at West Ham's London Stadium". Sunderland Echo. Retrieved 25 October 2016. ^ "EFL Cup: West Ham v Chelsea tie to see enhanced security at London Stadium". BBC Sport. Retrieved 25 October 2016. ^ "West Ham v Chelsea: Eight-year-old caught up in football violence". BBC Sport. Retrieved 28 October 2016. ^ "West Ham v Chelsea: Arrests after London Stadium crowd disorder". BBC Sport. Retrieved 28 October 2016. ^ "West Ham: MP says club should play behind closed doors if violence is repeated". BBC Sport. Retrieved 28 October 2016. ^ "West Ham: London Stadium should be knocked down says expert". BBC Sport. Retrieved 2 November 2016. ^ "West Ham fan 'punched Arsenal cameraman in face' at stadium". 8 December 2016. Retrieved 9 December 2016. ^ "Fans approach players during West Ham's defeat by Burnley at London Stadium". BBC. 10 March 2018. Retrieved 11 March 2018. ^ "West Ham fans to vote on whether to hold protest march against owners". BBC. 12 March 2018. Retrieved 13 March 2018. ^ "West Ham want life bans for London Stadium pitch invaders". BBC. 14 March 2018. Retrieved 17 March 2018. ^ "West Ham: Karren Brady apologises for London Stadium trouble". BBC. 17 March 2018. Retrieved 17 March 2018. ^ "West Ham give lifetime bans to pitch invaders at Burnley game". BBC. 22 March 2018. Retrieved 24 March 2018. ^ "West Ham: Further details of initial investigation into fan trouble are revealed". BBC. 23 March 2018. Retrieved 24 March 2018. ^ "West Ham v Southampton: Extra security for London Stadium game to cost taxpayers £60,000". 29 March 2018. Retrieved 30 March 2018 – via www.bbc.co.uk. ^ Association, The Football. "West Ham charged by FA". www.thefa.com. Retrieved 28 June 2018. ^ Stadium, David Hytner at the London (31 October 2018). "Son's double sees Spurs past West Ham and into quarter-final at Arsenal". Retrieved 23 January 2019 – via www.theguardian.com. ^ "West Ham: FA fines Premier League club £100,000 over pitch invasions". 22 January 2019. Retrieved 23 January 2019 – via www.bbc.co.uk. ^ "Olympic Stadium: T20 cricket deal 'in principle', say Essex". BBC Sport. 22 May 2014. Retrieved 22 May 2014. ^ Wigmore, Tim. "ECB considering using Olympic Stadium to host 2019 Cricket World Cup games". The Guardian. Retrieved 5 December 2016. ^ "2019 World Cup: London Stadium not one of 11 tournament venues". 26 April 2018. Retrieved 23 January 2019 – via www.bbc.co.uk. ^ "Why the London Stadiumâ€™s hidden intricacies remind us to appreciate cricket". The Independent. 27 April 2018. Retrieved 23 January 2019. ^ "'Setting sun' sealed fate of Olympic Stadium as London venue is omitted from World Cup plans". ESPN.com. 26 April 2018. Retrieved 23 January 2019. ^ Carpenter, Les (21 July 2018). "'You want to make sure you get it right': Baseball's big plans for London". the Guardian. Retrieved 13 November 2018. ^ "London's Olympic Stadium to host 2015 Race of Champions". ESPN. Retrieved 30 September 2015. ^ William Esler at the Olympic Stadium. "Team England claim Race of Champions Nations Cup crown". Sky Sports. Retrieved 14 May 2016. ^ William Esler at the Olympic Stadium. "Sebastian Vettel crowned Champion of Champions at Race of Champions". Sky Sports. Retrieved 14 May 2016. ^ "Olympic Stadium to host England-New Zealand rugby league Test". BBC Sport. 25 February 2015. Retrieved 27 February 2015. ^ Bower, Aaron (24 February 2015). "Olympic Stadium to host rugby league Test between England and New Zealand". The Guardian. Retrieved 27 February 2015. ^ The Rugby Football League. "England to Bid For Rugby League World Cup". Rugby League.com. Retrieved 8 July 2016. ^ "Rugby World Cup 2015: Olympic Stadium to host games". BBC News. 2 May 2013. Retrieved 24 August 2013. ^ "Olympic Stadium: Barbarians face Samoa in first match at venue". BBC. 19 February 2015. Retrieved 30 September 2015. ^ "Olympic Stadium to make rugby bow with Barbarians-Samoa ahead of World Cup | ESPN Scrum". ESPN. Retrieved 30 September 2015. ^ Purewal, Nick (19 February 2015). "Olympic Stadium to get Rugby World Cup warm-up when Barbarians take on Samoa | Daily Mail Online". Daily Mail. Retrieved 30 September 2015. ^ "Sprinklers put dampener on rugby's Olympic Stadium bow". BBC Sport. Retrieved 5 September 2015. ^ "Saracens v Harlequins at London Stadium". Premiership Rugby. Retrieved 11 July 2017. ^ "Axl Rose and AC/DC play first ever concert at London's Olympic Stadium". NME. 5 June 2016. Retrieved 5 June 2016. ^ a b c d "Getting Here". London Stadium. Retrieved 23 June 2016. ^ a b c "Getting here". Queen Elizabeth Olympic Park. Retrieved 23 May 2014. ^ "North East London Bus Map" (PDF). Transport for London. Archived from the original (PDF) on 19 August 2016. Retrieved 12 July 2016. ^ "A9 London Stratford to Stansted Airport". National Express. Retrieved 12 July 2016. ^ "London (Stratford) Bus Station". National Express. Retrieved 12 July 2016. Wikimedia Commons has media related to Olympic Stadium (London).